It doesn’t matter how woke you think you are; those of us who didn’t grow up Muslim always have more to learn. 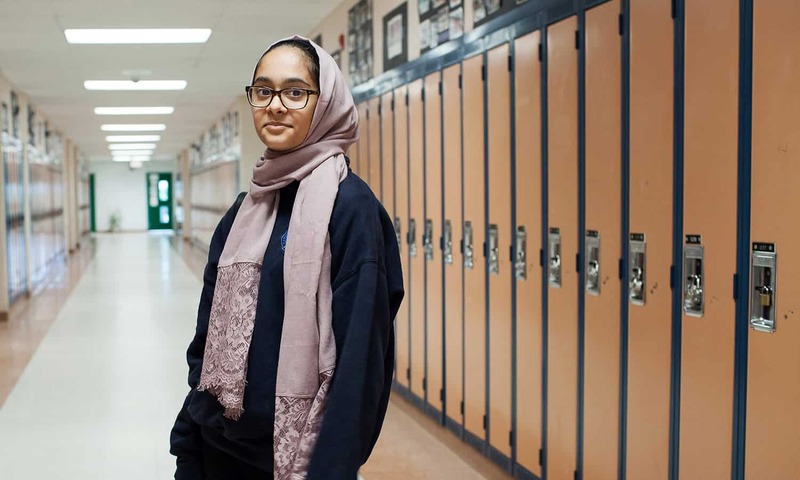 14 & Muslim, premiering on CBC Docs POV tonight (September 21), takes viewers inside Toronto’s Islamic Foundation School to get up-close and personal with Grade 8 students to openly discuss their fears, anxieties and excitement about growing up. Welcoming students from kindergarten to Grade 12, the Toronto Islamic Foundation school is one of the oldest of its kind in Canada, offering both Islamic education and standard Ontario curriculum. For many of the pupils, Grade 8 is a time when they must choose a path: stay within the comfort of the school they know, or venture to one of the local public or Catholic high schools. Being 14 is challenging no matter what your life looks like, but Muslim youth face several challenges that white kids in Toronto don’t: Will my classmates think I’m a terrorist? Will I fit in and be accepted if I attend an all-girls Catholic school? Will they make fun of my hijab? If I stay at the Islamic Foundation School, will I ever really learn how to integrate and make friends with the rest of society once I’m an adult? These are just some of the questions the young students ask themselves. As with most kids this age, their conversations meander from their favourite TV personalities and makeup to the complex horrors of ISIS. Eating their lunch on the playground, a group of girls try to make sense of why some Muslims interpret the Quran so differently than others do. Scenes move from the classroom to Prime Minister Justin Trudeau discussing Islamophobia in our country in the wake of the Quebec Mosque shooting, and then it cuts to audio of President Trump bellowing about the Muslim travel ban. It’s a world that no young person should have to deal with. Honest, poignant and timely, 14 & Muslim is important for all Canadians to watch. It is a touching and thoughtful documentary that will undoubtedly have you thinking about things from a different perspective. 14 & Muslim gives space, time, and a voice to a young community that rarely gets heard, and it’s so illuminating and touching to hear what they have to say. The world broadcast premiere of 14 & Muslim is tonight (Friday, September 21 at 9:00 p.m. EST) on CBC Docs POV. In honour of Islamic Heritage Month, there will also be a special free screening with filmmakers and film participants on Monday, October 15 at 7:00 p.m. EST at Isabel Bader Theatre (93 Charles Street West).